The National Institute for Newman Studies in conjunction with Duquesne University presents Insights from Newman for the Church Today. 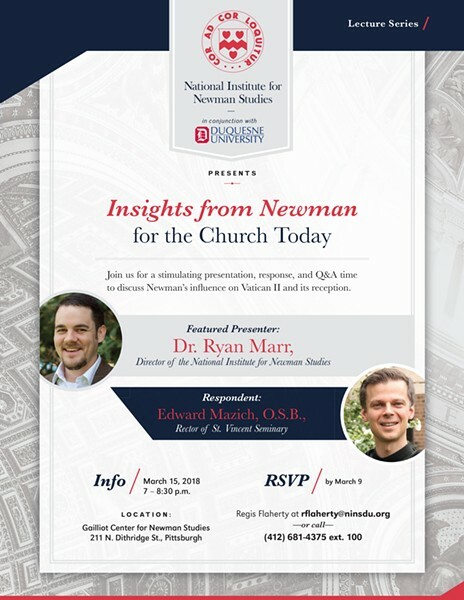 Join us for a stimulating presentation, response, and Q&A time to discuss Newman's influence on Vatican II and its reception with featured presenter Dr. Ryan Marr, Director of the National Institute for Newman Studies and respondent Edward Mazich, O.S.B., Rector of St. Vincent Seminary. RSVP by March 9 to Regis Flaherty at rflaherty@ninsdu.org or call (412) 681-4375 ext. 100.